Today is my Birthday and what a difference a Decade can make in someones life. I am Moving on to a new decade. I still remember those early days when i just turned 30. I just moved to NYC from Madrid to pursue my carreer as an Investment banker at the capital of the world New York City. Financial markets were in turmoil, extensive lay offs in the banking industry and it was my second brutal winter in NYC in the section of the Bronx called Riverdale ,Waldo Avenue where i had to go up a long set of stairs before getting home. At that time i decided to work on anything so at 30 i started working handling out flyers for a company in midtown. In the meantime i was hired by the fitness manager of New York sports Club cause he Loved the 60 minute anchor Mike Wallace who passed away few years ago and he thought i was his son. I got my first job cleaning machines. At that point i felt I hit a bottom and felt that everything will move on as part of a divine plan. I got myself immersed in Sports Medicine training clients, learning, researching and suddenly a divine plan was waiting for me. In all these last ten years a lot of things have happened but will never forget that no matter how great i feel now i will never forget where i was ten years ago hitting a low in a city thousand miles away from home from my family who i dearly missed. What a difference a Decade makes! Now a new decade has started where i was fortunate enough to get engaged to Victoria Doroshenko​ who has given my a wonderful daughter Chloe and my line of work has seen an exponential growth. 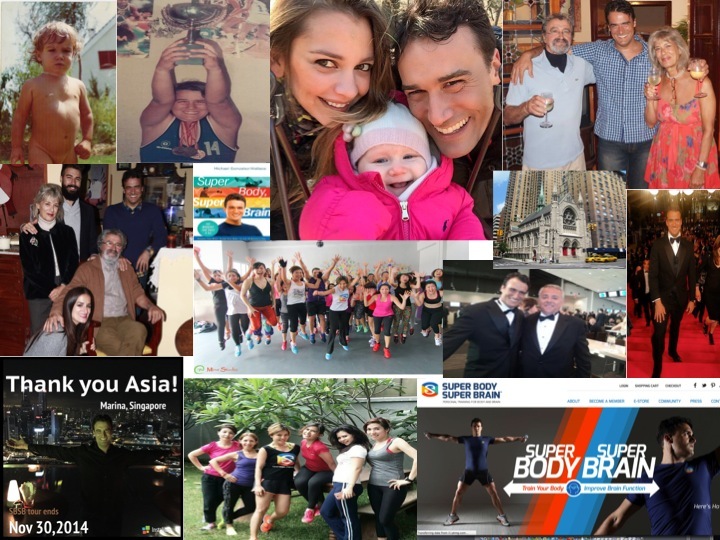 I never thought i was going to be so lucky of doing so many things such as writing a book with the Top publisher in USA HarperCollins​ or get investors to invest in my website for Online personal training or even work with clients in need of help such as Alzheimer or Autism or even reach one of my biggest professional accomplishments of reaching far east lands like Asia which i only use to dream of visiting like one of my most admired historical figures like Marco Polo​. Thanks to Tina Maladi​and especially Susy Bachtiar​ i was able to accomplish one of my dearest dreams of visiting those lands with so many great people showing me support, love and guidance.This reminds me to the Great Philosopher Confucius where he said that “ At 15 i began to study ,At 30 I took my stand and at 40 i put my doubts away” At 40 i feel i put my doubts away and keep walking strong with a clear mind and a serene heart appreciating everyone who you have offered me support, guidance and encouragement in this fascinating journey called Life. Now that i confessed my inner thoughts lol i am ready for this Decade to start NOW!